Everson is a city of 2,500 in northwestern Washington. It sits along the Nooksack River, adjacent to the city of Nooksack, at the foothills of the Cascade Mountains. 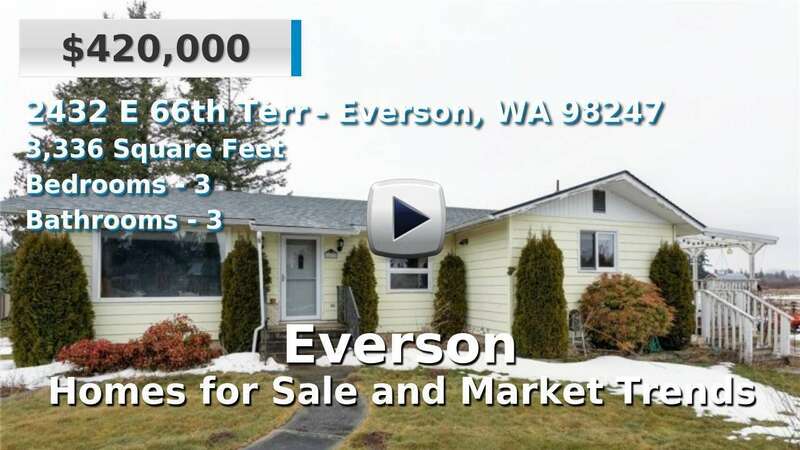 Everson is just under 10 miles to Sumas and the border with British Columbia, Canada. Bellingham, the county's largest city, is about 20 miles south of Everson. This growing city has newer than average homes for sale and a typical commute of about 20 minutes. Nearby Mount Baker offers an array of year-round sports and recreation. 3 Beds | 3 Baths | 1940 sq. Ft.
3 Beds | 1.5 Baths | 1704 sq. Ft.
4 Beds | 2.5 Baths | 2782 sq. Ft.
3 Beds | 2.5 Baths | 2060 sq. Ft.
3 Beds | 1 Baths | 1400 sq. Ft.
4 Beds | 1.5 Baths | 1392 sq. Ft.
3 Beds | 2.75 Baths | 1748 sq. Ft.